QUICK PIT STOP: How are we getting these estimated value numbers? We’re guesstimating, a bit – but these are very close to profit numbers we see for all of the businesses we work with. How? A well-performing SEO page can bring in several new customers each week. Doesn’t sound like much, right? When you add it all up, it’s pretty impressive. With a $100 product, if a page brings you 1 sale a week, that’s $5,200 a year. When you start crafting several pages at a time, you’ve got an impressive income stream on your hands. That’s the power of search, and that’s why SEO tips and tricks like these can be so valuable. Backlinks from other websites are a big part of any SEO strategy – but that’s not the only type of link that makes a difference. Links on your own pages make a difference, too – and a small shift can do wonders for improving your rankings. Also, Google rewards pages that are what they say they are. Each page’s content should match its title and keywords as well as possible (this is especially important for eCommerce stores like Shopify). 1. Are your main headings in <H1> tags? 2. Are your subheadings in <H2> and <H3> tags? 3. Does the title of your page contain your keywords? 4. Does the main heading on the page contain your keywords? But why reinvent the wheel when you have an excellent model for how to rank highly in your niche: your top competitors. I’m going to show you how to profitably spy on their SEO habits, and you won’t believe how easy it can be. Note: this is only for websites that are ranking poorly in search engines. Do me a favor. Type in a popular keyword phrase for your niche, and see who the top three or four results are. Click on one of their websites, and look at it closely. Take note of the structure of the page. What does their headline say? How long is their text? Do they have lots of links in the text of the page? Now comes the important part: we copy what they’re doing. Not the text of their site, of course, but the structure. Make sure your page has approximately the same word count (preferably longer), contains the same keywords, has a very similar heading, and a similar title tag, too. Important: Do NOT steal the text/content from their pages. Google knows all and will penalize your site! Find the most successful of your competitors, and take notes on everything. What is their text like? What is the tone like? How about their layout? Title tags? What makes the site good? What about their color scheme? Don’t be afraid to copy. Some of the biggest websites you see are probably there because someone knew how to copy someone else. By the time you are starting to see some more traffic, you should have a better idea of how to really make it yours. Within a few weeks, you should see an improvement in your rankings. It’s not a permanent strategy, but it’s a great way to launch your site and start getting real traffic. 5. Make a few videos and put them on YouTube. Google loves to rank Youtube videos highly. In fact, videos are 50x more likely to show up on the 1st page of Google vs. traditional text pages. Even if your website isn’t hitting the front page, your YouTube video just might. So how do you get your video to rank on the first page of Google? Make something entertaining, interesting, or really useful – something sharable. There’s more on that here (https://blog.kissmetrics.com/guide-to-video-seo/) and here (http://backlinko.com/how-to-rank-youtube-videos). 6. Write ‘definitive guides’ to things. Want to know a secret that SEO professionals discovered a long time ago? The secret to getting a lot of backlinks to your site is: Make your site irresistibly informative. And almost nothing is as informative as a how-to guide. Especially one that’s authoritative, and easy to use as a reference. If you can manage to write something truly useful, people will share your guide. Write a “Bible to…” something, or “The Encyclopedia of…”. Make it sound authoritative. If you can manage to offer something that’s not found anywhere else, then your chances are even better of getting some shares and thus traffic. 7. Claim your free backlinks. 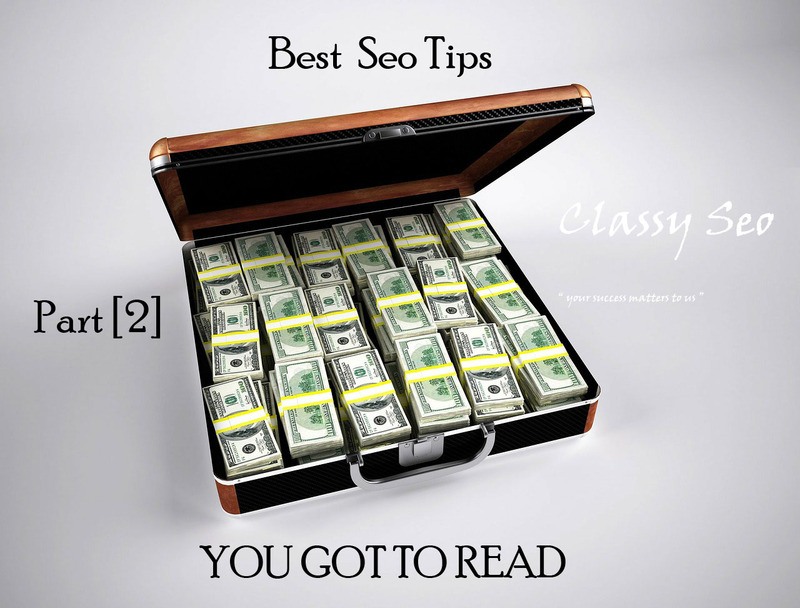 Some SEO tips and tricks are tough to wrap your head around, this one’s a no-brainer. You can find a list of 17 platforms that allow you to link to your website here (http://backlinko.com/17-untapped-backlink-sources). 8. Steal backlinks from your competitors. Open Site Explorer will be really helpful, because you can check where your competitors are getting their backlinks, among other things. It’s not a bad idea to try to get to know the owners of those websites linking to your competitors. Sometimes a little interest in what someone else is doing can go a long way. Introduce yourself to website owners. Tell them how much you like their new articles about selecting a lawnmower or about how Facebook is ruining civilization as we know it, or whatever. A little praise can go a long way. Then ask for a link. You might hear no or nothing at all a few times before you hear yes, but don’t get discouraged. 9. Connect with bloggers in your niche on social media. Building on the last tip, reach out to bloggers who would find you relevant. Introduce yourself. Give them some commentary on what they do. Once again, show interest. If you can manage to get some people writing about you, it can be a huge asset to your business. The catch is that this is probably the most time-consuming and difficult step. It can take weeks or months to get some bloggers to care. Reserve this one for after you’ve done the other 8. Ranking highly in search engines equals more money for you. The sooner you employ these tips, the sooner you’ll see rewards. Looking for more than just SEO tips?